How do you begin to work inwards to improve employee health? A good manager, or a good business, should have a keen interest in keeping their employees healthy and happy. However, the road to health and happiness is not a straight line. Many companies offer opt-in health initiatives, like gym memberships, yoga classes, or wellbeing programs. Unfortunately, these programs aren’t usually worth their cost, as the vast majority of employees don’t bother using them. The reason being, those activities require extra time and effort above and beyond our routine. Time and energy are precious resources, and we are loathe to give them up. Human beings are far more likely to follow our habits and do what is comfortable than take on additional tasks. How do we turn comfort into productivity in the office? A huge part of the culture of any given workplace is the physical office space itself. This has more of an impact on your employee’s productivity than you might think. Though it’s not the only factor in your employee’s happiness, it is one you have a lot of control over. When MEC decided to build a new head office building, they developed a strong example of these principles combining natural elements, lighting and interconnected spaces. You can learn more about their award winning home base here. Here are some of our favourite ideas you could try to create a healthier, happier, and more productive office space. As more and more offices are built with the following principals, employees will start to expect them. A modern, forward-looking office is becoming an important part in attracting and retaining employees. Work inwards, not outwards: Most offices copy and recreate what is innovative, valuable, or popular in other office spaces. Figure out what your office needs, and work towards changes that serve those needs. Remember that what works for one office may not work for yours. Open space – carefully curated – creates new ideas: Over time, office hierarchies have flattened out, and less space is dedicated to the boss’s office. Open, public workspaces might have received some bad press of late, but when strategic private spaces are introduced they can be a very positive environment for collaboration. There should be somewhere in your office that allows for chance meetings, exchanges of information, and new ideas to occur spontaneously. Privacy is still fundamental: Distraction kills productivity. Though it is important to have shared open space to inspire new ideas, it is also essential to provide your employees with quiet places to actually work on those ideas. You could have library-like spaces where quiet is the norm; you could create a space without internet access to cut down on external stimuli; or you could install private rooms for people to work with their laptops. Natural offices: Plants, natural air, and sunlight are each massive contributors to health and happiness in the workplace. Consider wood paneling, alternate natural furniture, anything that adds an organic feel. Working in a windowless box isn’t fun for anyone. Give your office some life and greenery, and make sure the air in your office is something you want to breathe all the time. 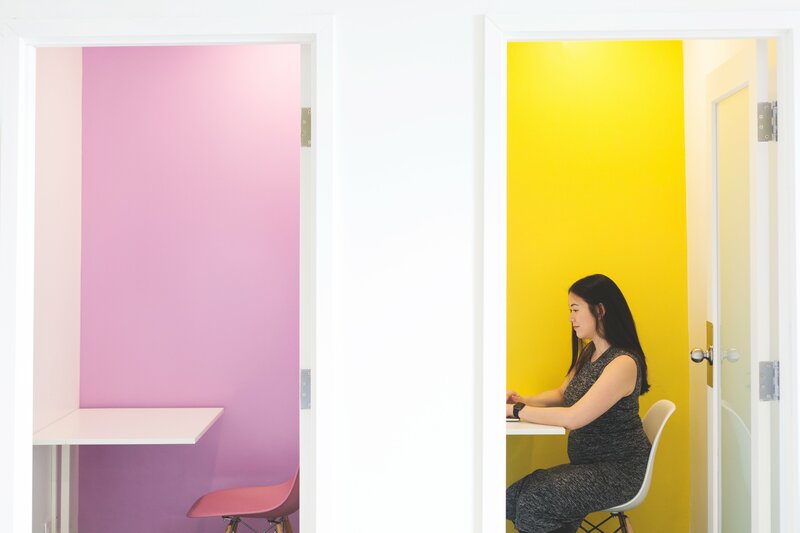 Colour and specificity: the colours of your office can affect your employee’s mood. Pick certain colours for different workflows and provide a few visual aides or stimuli in meetings to focus attention. Visual variety is key. Spatial awareness: Your employees will most often use the things closest to them, whether that’s food, elevators, stairs, or fire exits. When designing or choosing an office space consider a central staircase at the front of your office to promote physical exertion. Be conscious of where items are in your kitchen areas and what’s closest to the door. Make sure that what your employees need is within reach. Improving the daily routine of your employees doesn’t always have to be expensive or involve construction projects. One of our clients at Goldbeck Recruiting provides a software product to fitness businesses, and they live and breathe the industry. Recently, they implemented a program where every day, for a few minutes, their entire team exercises together in the office. This releases stress and energizes the time, all without any hard costs for the company. Personally, here at the Goldbeck office I invited a massage therapist in for free sessions on stretching exercises to release stress caused by desk posture, holding the mouse for a long time and looking at a screen all day. It was free, very informative and the team went away with a greater appreciation for self-care. As recruiters, clients come to us to share their healthy initiatives and spaces for us to use as a tool to attract talented candidates who value wellness. As this personal care knowledge grows, more and more potential hires are expecting this to be at least a small part of the overall package. More and more of your new employees are likely to be highly educated, intensely connected to the people around them, and financially insecure. If you’re reading this article, then they might be as well. They’re aware of other businesses in your field, how much they pay, and how they treat their employees. They’ve read story after story telling them traditional office environments are bad for their health, happiness, and productivity. There is no reason for them to stay with a company that neglects their well-being. This is an asset to you, not a problem. Survey them. Ask them. Let your employees tell you how to improve your workspace. One thing we hear from our clients is that they like to make sure they structure their “ask.” Conduct your surveys, interviews, or interactions on a schedule so the amount of feedback isn’t overwhelming. Implement the changes backed up by data and research, and keep an eye out for any recurring or common suggestions. Offer your employees the chance to help shape their workspace and they’ll feel invested in their place of work. Give them the opportunity to take pride and satisfaction in what you’ve made together.